This post is sponsored by Welch’s® Fruit Snacks. I am being compensated for this post. All comments and opinions are my own. Can you believe it is already time to start thinking about the back to school season? While it seems as if the kids just had their last day of school, I will soon have a 1st grader, 3rd grader, and a 6th grader. My kids all take homemade lunches but are starting to snub regular bread. Only one likes salad, but they all do love ham and cheese. 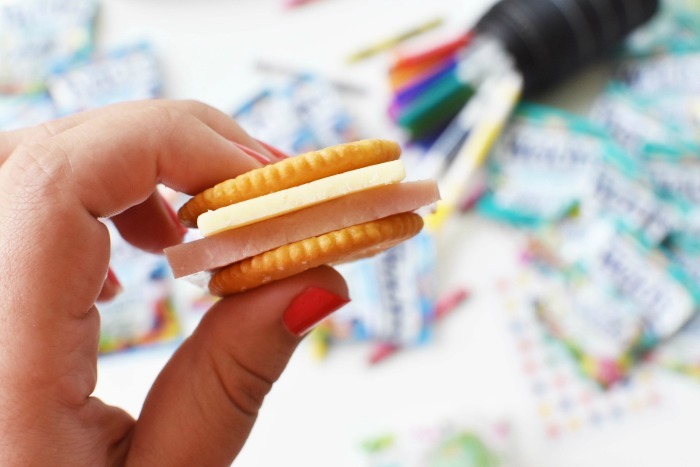 That is what inspired me to make this easy kid’s lunch idea: Ham & Cheese Cracker Stackers with Sides. I am sure your child is probably enthused with the idea of making their own little meat and cheese cracker sandwiches. I know my 3 kids feel so official, and enjoy every crumb of their lunches when I give them these. But alas, no Ham & Cheese Cracker Stackers lunch is complete without sides. 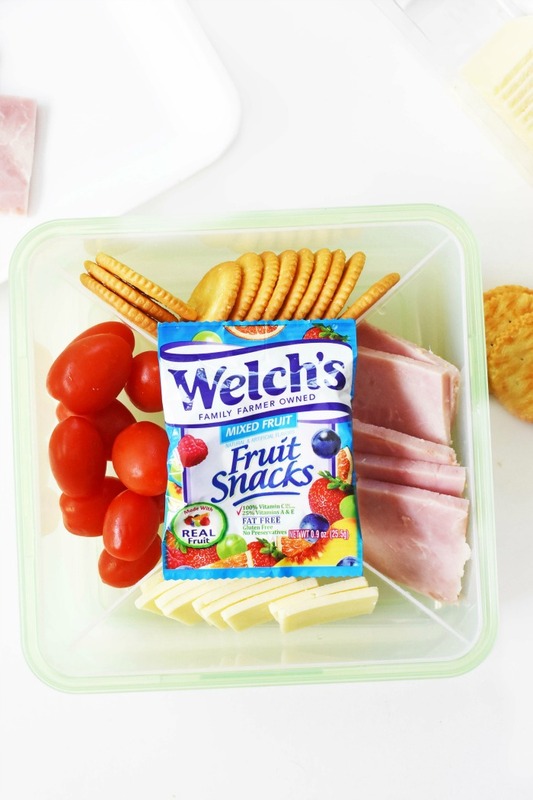 To balance my kid’s lunch, I offer a produce item and a fun snack like Welch’s Fruit Snacks. What kid doesn’t love Welch’s Fruit Snacks? Gosh, I remember loving them as a child and always requesting the grape flavor from my siblings. I love how these fruit snacks are now available at all retailers like Stop & Shop, in expanded flavors like Mixed Fruit. Berries ‘n Cherries, and Island Fruits. Each box comes with 10 bags and are perfect for summer snacking or easy kid’s lunchbox ideas! 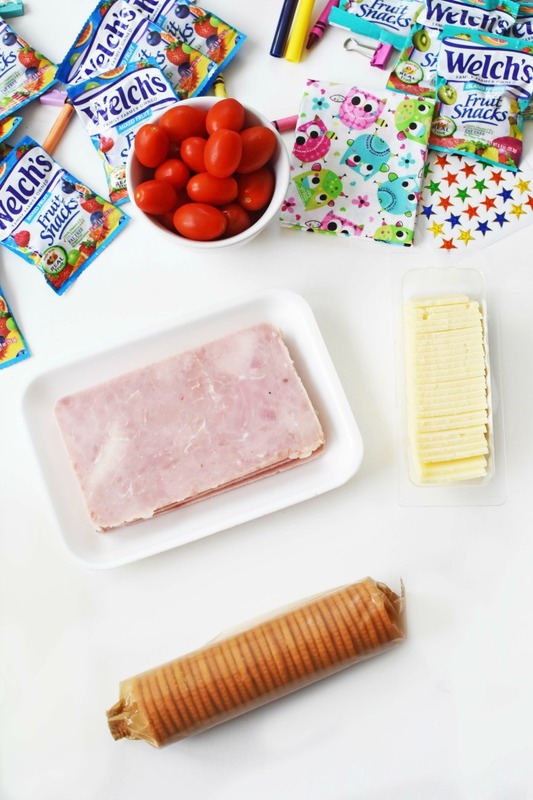 Want to recreate this easy kid’s lunch idea of Ham & Cheese Cracker Stackers with Sides for your child? The good news is it is EASY, PEASY to do! I don’t know about you, but I am all about the quick, easy, and yummy lunch ideas for kids! 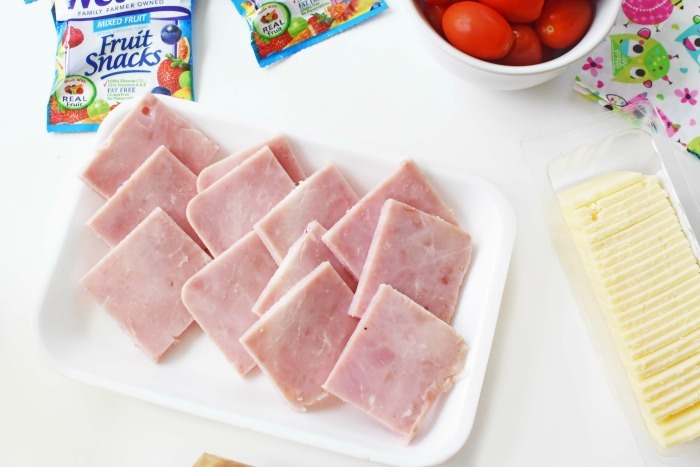 Slice ham into quarter-size squares. 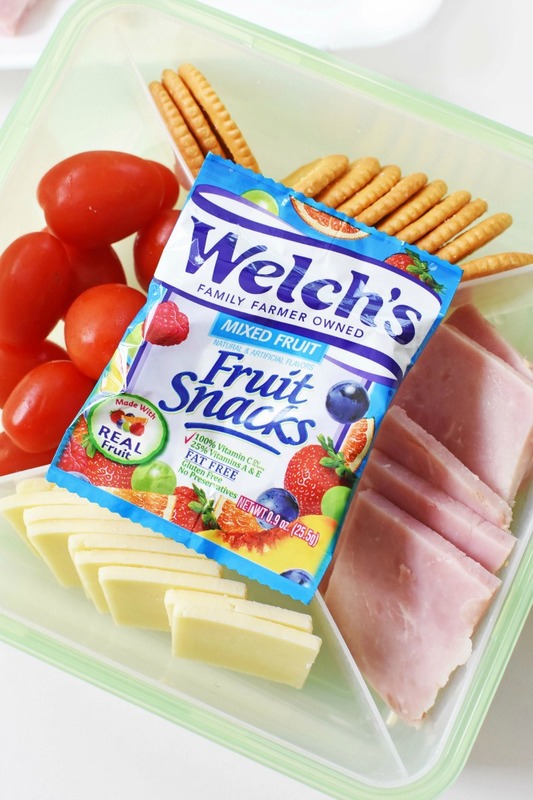 As you can see, these Ham & Cheese Cracker Stackers with Sides pair perfectly with Welch’s Fruit Snacks and make an ideal back to school lunch that your child is surely not going to waste. 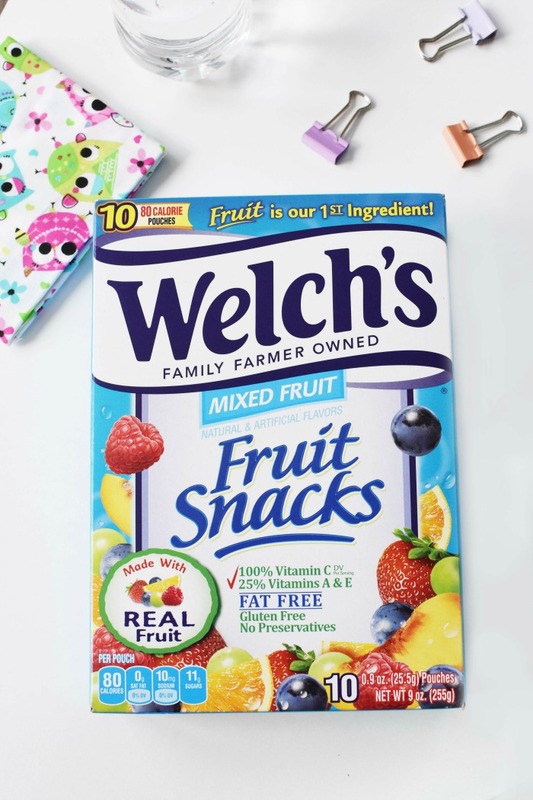 I love giving my children Welch’s Fruit Snacks because they are not only made with real fruit, but fruit is the first ingredient in them! My kids love their texture, and vibrant flavors. Be sure to stock up on them for the back to school season! What are some of your easy kid’s lunch ideas for back to school? These are perfect for lunchboxes, and they look tasty, too. I think they’d make great appetizers for parties, as well. This is such an amazing lunch idea! Would love to give it a try! I am sure my kids will love this! 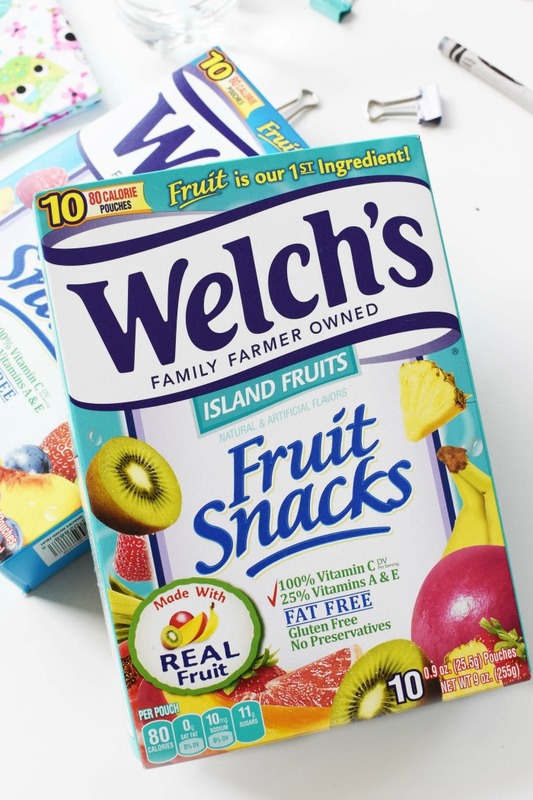 We love the Welch’s Fruit Snacks and buy them in bulk at Costco. They’re great for snacks and lunches!